I’m walking gingerly on the uneven cobblestone, the narrow streets surrounded by tall gabled buildings. The air is full of history, permeating structures and streets, in contrast with modern activities taking place. Much of the architecture falls within the red brick Gothic style uniquely representing the height of an era going back one thousand years. Slowly, I’m sensing from centuries past the apparitions of people who’ve passed through this place. I tuck into a narrow passageway and stop. If I close my eyes, I hear the ancient sounds as though they’re etched into the grooves between the red brick. Shouting, negotiating, best products from around the world, best stuff money can buy, best deals you can get for miles around. I’m fascinated by the influence of merchants who cast a massive net across northern Europe. I’m interested in the history of architecture and trade, how a town surrounded by an important river a mere 20 kilometres from the sea became a hub and crossroads for the movement of people and goods. This special place is the “Hansekönigin”: Queen of the Hanseatic League. In the mid-13th century, a flexible alliance of merchant city-states in northern Europe created the Hanseatic League (Hansa), allowing preferred trading, mutual cooperation, resource sharing, and common defense. The League at its peak had over 200 towns and villages as members, controlling shipping and trade in the North and Baltic Seas, with “Kontor” (trading stations) established as far east as Novgorod, Russia, and out west in London, England. With the continuous flow of a large variety of goods, the League brought commerce and industry not only throughout northern Europe but particularly to what is now northern Germany. The League lasted four centuries, and out of all the Hansa’s legacies, perhaps one of the most famous is the German airline company “Lufthansa”: ‘Luft’ for air, ‘Hansa’ for merchant alliance. Founded in 1143 and declared a free Imperial city in 1226, Lübeck provides a beautiful and medieval glimpse to centuries of naval and shipping tradition. 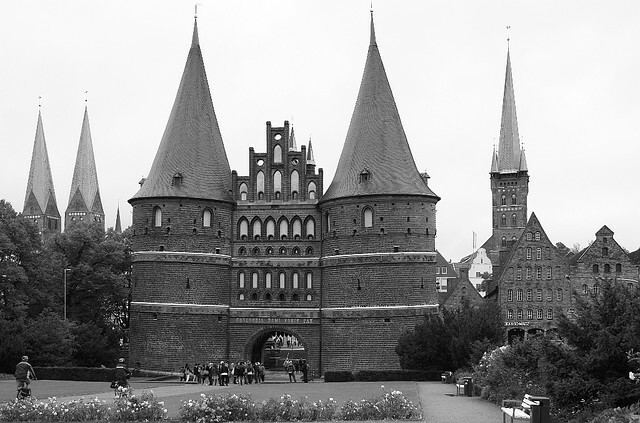 Lübeck once reigned and ruled northern shipping routes as the capital or “queen city” of the Hanseatic League. The historical importance and impact on the surrounding region and nearby sea earned the city the nickname “Gateway to the Baltic”. With the city steeped in historical architecture, UNESCO declared in 1987nthe “Lübecker Altstadt” or Lübeck’s Old Town a World Heritage Site. You’ll find most of the city’s highlights in the Old Town, situated on a flint-shaped island sandwiched between two arms of the Trave river. You can easily cover the entire compact Old Town on bicycle or on foot, and don’t be surprised should you cross the Old Town several times throughout your visit. 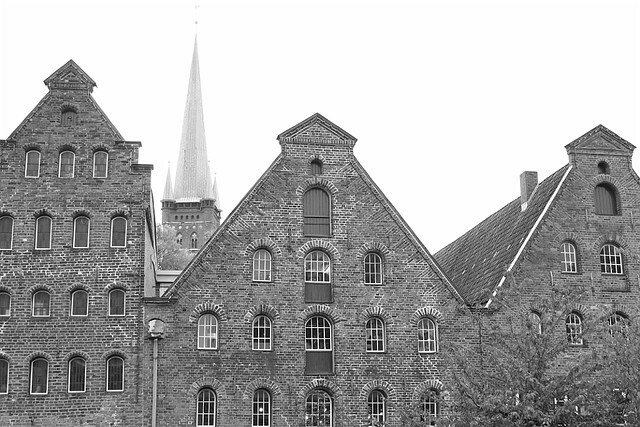 Learn about the city’s history at the 15th-century Holstentor (Holsten Gate) and the 16th-century brick gabled Salzspeicher (Salt Warehouses). Check out the different decorations on the inward city-facing and outward-facing sides of the leaning sinking Holstentor. Gaze skywards to the spires of the town’s Gothic churches: Dom (Cathedral), Jakobikirche (St. Jacob’s), Katharinenkirche (St. Katherine’s), Marienkirche (St. Mary’s), and Petrikirche (St. Peter’s). For size, grandeur, and history, the Marienkirche is a highlight for both city and the region. Discover how three Nobel Prize winners have connections to this town: Thomas Mann (1929 Literature), his brother Heinrich Mann, and their family lived at this Buddenbrook House; former West German chancellor Willy Brandt (1971 Peace) was born here; Günter Grass (1999 Literature) lived in town for a number of years. The map below shows the locations of Lübeck’s main train station, the Mann family Buddenbrookhaus [B], Dom [D], Glandorps Gang & Hof [G], Holstentor [H], Jakobikirche [J], Katherinenkirche [K], Marienkirche [M], Niederegger [N], Petrikirche [P], Rathaus/-markt [R], Salzspeicher [S], Willy-Brandt-Haus [W]. 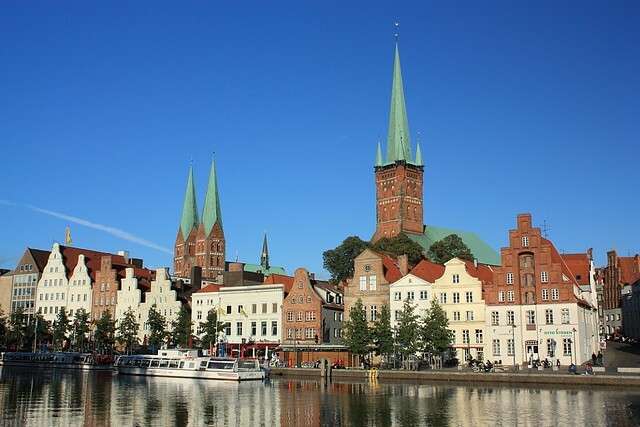 Lübeck is about 70 kilometres to the northeast of Hamburg. A regional train from Hamburg is a 40- to 45-minute trip, valid under the local Schleswig-Holstein local fare structure; note that the cost of a daycard or day-ticket (Tageskarte) is cheaper than two one-way tickets (Einzelfahrkarten). To access the sea from Lübeck, it’s only 20 kilometres to the beach resort town of Travemünde, where the river Trave flows out into the Baltic Sea. Lübeck was among the nation’s 30-plus UNESCO World Heritage Sites featured by the Germany National Tourism Board in 2014. The city also played host to the 34th International Hanseatic Day in 2014. I made all three photos above on 29 Sep 2009. This post appears on Fotoeins Fotopress at fotoeins.com as http://wp.me/p1BIdT-4EZ. Wow! Those spires are something else. Incredible.